Appleby staff had the unique opportunity of getting up close to the iconic America’s Cup trophy on Friday [May 15] during a VIP visit to the firm’s office by the America’s Cup Event Authority. Appleby is the Official Law Firm of the 2017 America’s Cup. Chief of Development at the America’s Cup Event Authority, Steven Roberts, talked to Appleby employees about the exciting 2017 America’s Cup event taking place in Bermuda, while Golden Gate Yacht Club Commodore Norbert Bajurin provided a brief history on the event and the trophy. Appleby staff took part in a group photo and many took their own “selfies” with the trophy, spreading their excitement at seeing the Cup via social media using the hashtag #thecupstopshere by posting their photos online. 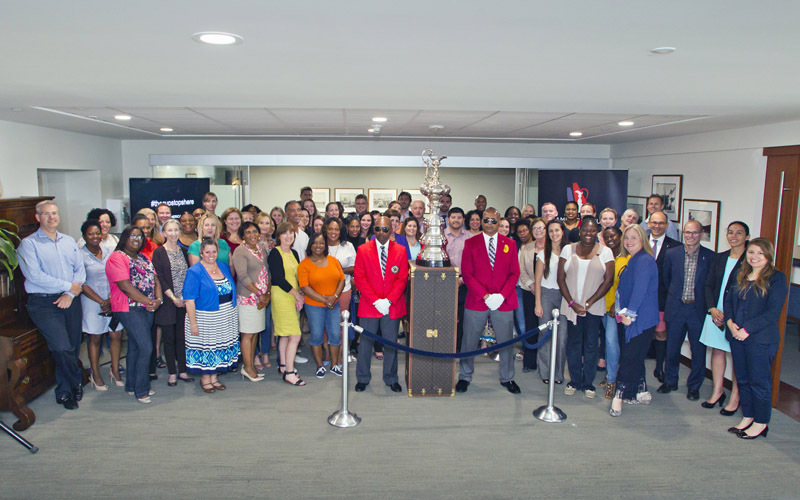 Bermuda Office Managing Partner Kiernan Bell said: “We were thrilled to have the America’s Cup trophy visit our offices and to see in person the historic silver trophy which embodies the sport of sailing around the world.